Discussion in 'Port-A-Potties / Cassette Toilets / Bath Houses' started by RobM604, Dec 24, 2016. Avoid #2 on the day of departure. We call them "Morning Turds" and they don't have time to break down. Thanks for the heads up, or bottoms up, or whatever you want to call it! There shall be no "Morning Turds." No morning, or other time of day, turds for us. Just use our Thetford Porta Potti https://www.amazon.com/Thetford-92850-Porta-Portable-Toilet/dp/B006WPQMOA/ref=sr_1_2?ie=UTF8&qid=1485275317&sr=8-2&keywords=thetford+porta+potty to pee in at night. It's low enough that I had to build a little riser shelf to mount it under one of our dinette seats. We remove the cushions from that bench seat at night, slide open the support plywood, and have the potty available if needed. Next morning separate the base from the top, carry the base to the dump station or bathroom, dump, rinse twice, then add an ounce of the blue green chemical and it's ready for the next night. I have shower/toilet cassette in my Niagara, I refuse to use it for #2 for same reason why I do not cook inside. I have thought of a few funny replies to your last post Halford, but I will keep them to myself. Why is poop always funny? We only number one at night as well, but there have been a few "Poomergencies" with my two young daughters. One, we were driving to the CG. 3 year old says, "I have to go potty." Me, "Are you the boss of your poo-poo?" Ten minutes pass and then, "Daddy, I have to go now." "Honey we are half an hour from the CG and there are no places with bathrooms for half an hour, can you hold it." That's when the lightbulb went off: the cassette toilet is right inside the PUP door, so a pull off on the road, I make an L-shape with PUP and TV for privacy and pull the toilet out of the PUP and problem solved. Wish I was the boss of mine! I'm still the boss of when it comes out, but would like to be several other requirements on it. 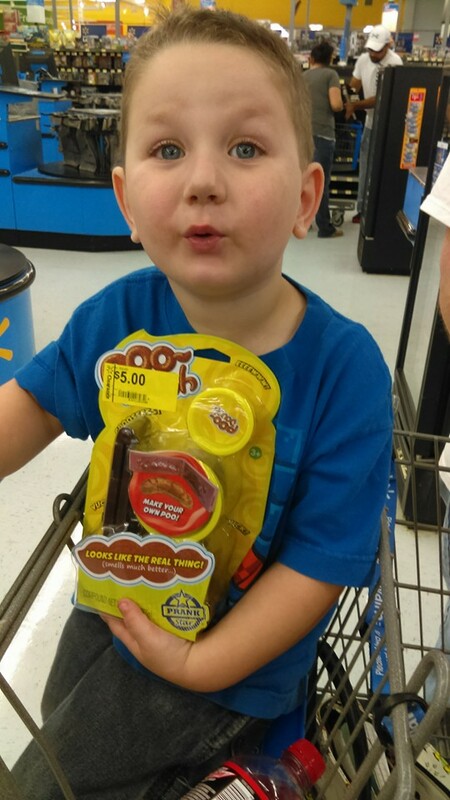 Poop is always funny - my youngest grandson has a poop playdoh set. It's very realistic coming out of the mold, even comes with a bit of yellow playdoh so you can mold some corn in. And some green. It's actually really disgusting. If you think this photo is gross, you should have seen the one my grandson made! It was so much nastier. Not sure if that was because it was on my table, or just just because it really was. Looking for the pic of his, for your viewing pleasure. ETA: Found our pics - prepare to be mortified. 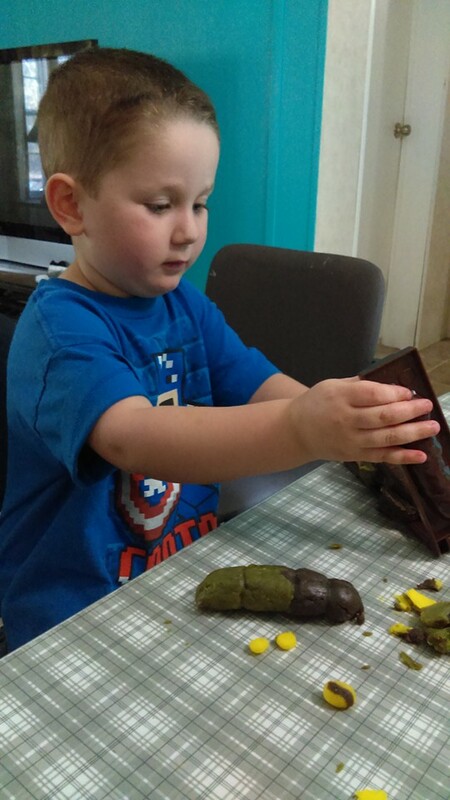 Me: Owen, you don't really want to make Playdoh poop. Owen: I think I do. That stuff would make some pretty good pranks, not that I would be doing the pranks! It's on clearance for like $1 now at Walmart. Apparently not enough parents went for us, only us sucker grandparents. Just so I don't run too far off topic, here is the current toilet set-up in our PUP. I love it so much that I'm almost obsessed with it. Having camped my entire life, into my 40's, and gave birth to and raise four kids camping with toilet other than the bath house, I appreciate this thing so much. I wish we had a PUP when our kids were growing up, or at least a porta potty, for night time use. Unfortunately, it wasn't until they were mostly grown that the internet let me in on the ease of use of chemical toilets. Boy, HOWDY; I'd like to have been in the marketing meeting when they pitched this idea to the sales team. What the .....?!?! 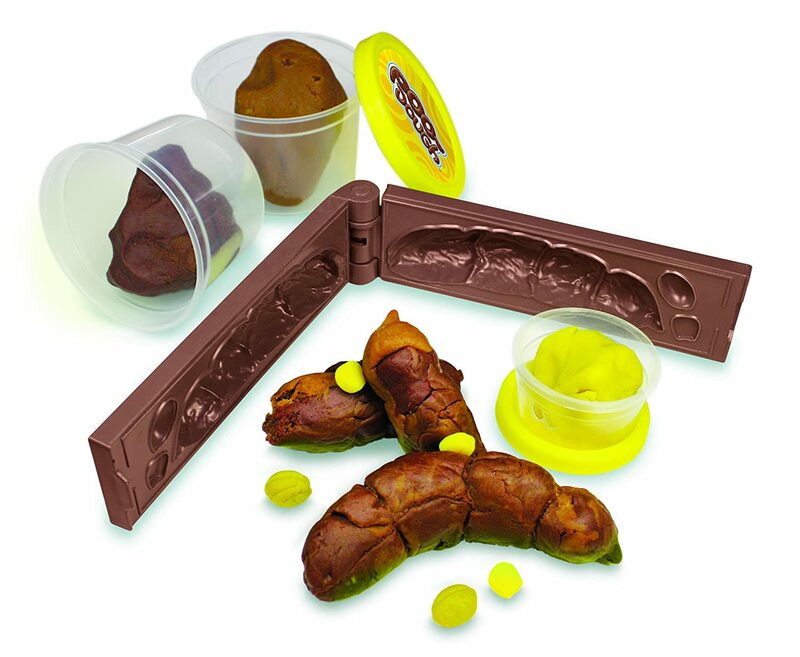 Poop was a hot seller in the toy market about a year ago. There was a board game about it (forget the name,) a version of Baby Alive that pooped in addition to her usual pee, even a Barbie that comes with a dog that poops - comes with a dog, dog bowl, and three turds. I feel the same way. That is exactly why I asked before letting it happen. Even after reassurance, on all but "morning turds," I only let the youngest grandson poop in it. The same one pictured above. He is going through the "impressed by gross body functions" stage and had been wanting to poop in it for some time. I figured if it were an adult one that didn't dissolve, I may have to burn down the camper. It's only been a couple years since I was changing this one's diapers, so he got to do the honors. It was all dissolved. Thank God. Still yet, we will only use it for #2 in emergencies, just was good info to know. I do plan on building (translate: supervising DH building) hard walls for our shower this summer, when we won't be able to camp. That is mostly for the shower, but will make #2 more acceptable under special circumstances. This really just cracks me up that some people are mortified to empty the cassette. If you just use the proper chemicals you wont have that problem. I would rather empty the cassette than have a black tank that you really can't rinse that well no matter how many gimmick rinse adapters they make. Me and DW just lock camper door, that is how we know if one of us needs a little privacy. Thought about doing the hard walls but after looking and thinking about it I felt is was just not worth the trouble. By the way Orchid I found some of the poo dough, but the wife said NO! I'm okay with emptying it, as I use the proper chemicals. Just sayin' that if an adult turd somehow managed to remain solid, I may need counseling and potentially medicated. I completely agree that I would rather have a cassette than a black tank. I can not imagine not being able to rinse it out well, and clean easily. At least your wife only vetoed only poop doh. I haven't broken the news to DH about building the hard wall enclosure yet. I'm sure he will try to veto it. I really want to be able to use the shower without fear of leaks, so I'll talk him into it. I tell you what if I ever get to Florida, I want to be in the same camp ground with you. I bet you are a hoot to visit with. Thanks If you ever do get over this way, give me a holler. We are free most of the time. I'm sure we would enjoy camping with you guys. Our bathroom system comes into play once we are ready for bed. We have a medical bedside toilet and put a toilet bag into the pail underneath with some kitty litter in it and, if we have it, powder chemicals for the toilet. It comes inside the camper into the doorway at bedtime, and the next morning it is stored behind the back bunk outside. Simply remove the bag and you're done. No messy tanks to contend with later. Just a simple wipe clean of the unit. We found some 12-pack toilet bags at the thrift store, with 3 packs bundled together for $2. Not bad for 36 bags. I think I will stick to the cassette, I don't think I could handle the bag thing. Just curious how do you dispose of the bags and what is in them? We have used the gel bag system, and still do if we take the trailer out when it's winterized. The products we use are approved for disposal in landfills, so we toss them in the dumpster. The PETT/Go-anywhere/Clean waste system, uses a double bag system - the inner one with the gel powder and a heavy zippered one. (We bought extra Poo Powder too, which has come in handy. It is similar to what is in diapers.) These bags, also known as WagBags, are one of the brands approved for back country use, where pack it out means all human trash. They are sometimes handed out by the ranger offices. Also approved for military and natural disaster use. I'm not sure kitty litter with human waste has the same approval level. We never has a cassette system in our pups, and I was more than a little leery about having to cope with dumping the waste tanks when we bought our TT. Turns out that is isn't horrific, as I feared it might be. My biggest problem is coping with getting all the connectors attached/detached correctly, with my small and problematic hands. was a little Leary of the cassette also, but turns out it's a snap. so easy to empty into any toilet at cg. if out boon docking just pull the cassette and empty at home, no problem. Thetford cassette toilet with built-in shower. Personally I can't imagine doing #2 in it, but my wife and kids can't imagine doing #2 in CG restrooms, so it clearly serves a purpose for them, especially on cold nights and mornings. The shower is great. I never had the luxury of a shower while camping before getting this PUP, but now that I have it, I'm sold. There's nothing finer than getting cleaned up after a day of hiking. The down-side to the shower, and the toilet, is that I'm the one designated for fetching water and disposing of waste. Maybe that's why I, myself, refrain from using the toilet for serious business. Do you have a link to that kit? These aren't "kits" that one can buy at retail but rather units installed by popup manufacturers. 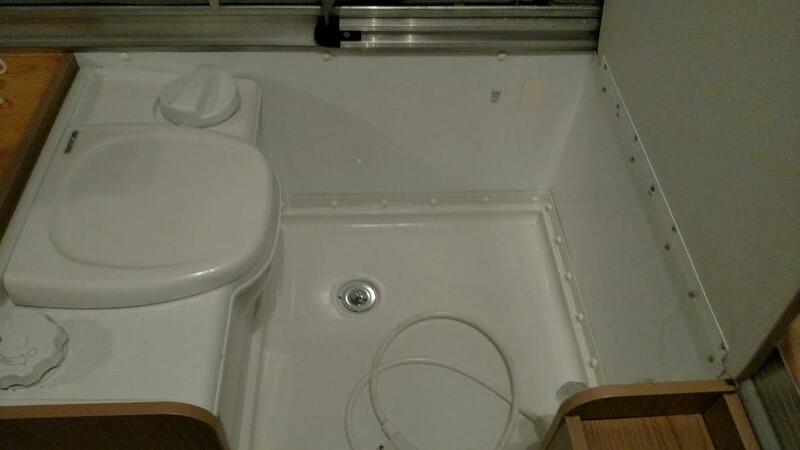 Your only option is to find one that has been removed from a camper and it would seem you're in luck as another forum member does have one for sale.